Exceptionally beautiful, the Undulate Triggerfish (Balistapus undulatus), also known as the Orangelined Triggerfish or Orangetailed Triggerfish, is regarded by many as one of the most bold and belligerent fishes collected for the aquarium trade. It is notorious for attacking divers who come too close to its nests—exactly the kind of reef fish some aquarists love. 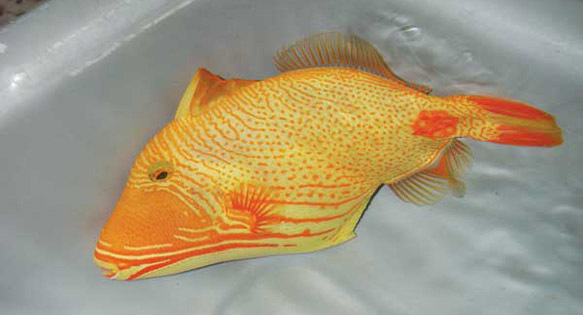 Undulate Triggers normally have an emerald-green body with sweeping yellow-orange diagonal stripes, but occasional specimens appear with a gold body and orange patterns that may suggest war paint. 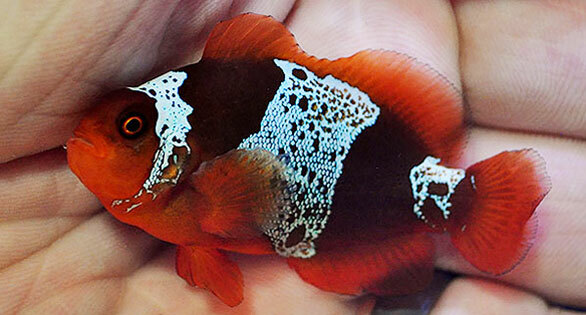 Dave Palmer spotted this exceptional fish in an incoming shipment at Pacific Aqua Farms in Los Angeles. Like what you’re seeing? Additional entries from the “rarities” column can be seen in every issue of CORAL Magazine.